In these figures we can see two configurations. Here, points coordinates are the same, only a normal changes its direction (they are both represented in green). As we can see it plays an important role in the final shape of the surface. Using normals in addition to points has several advantages: the underlying algorithm will be more robust and easier to implement unlike other methods who only uses points (like standard RBF reconstruction). 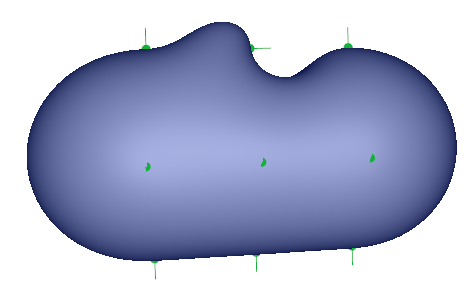 Also normals gives more control to the user like tangents used for 2D curves. 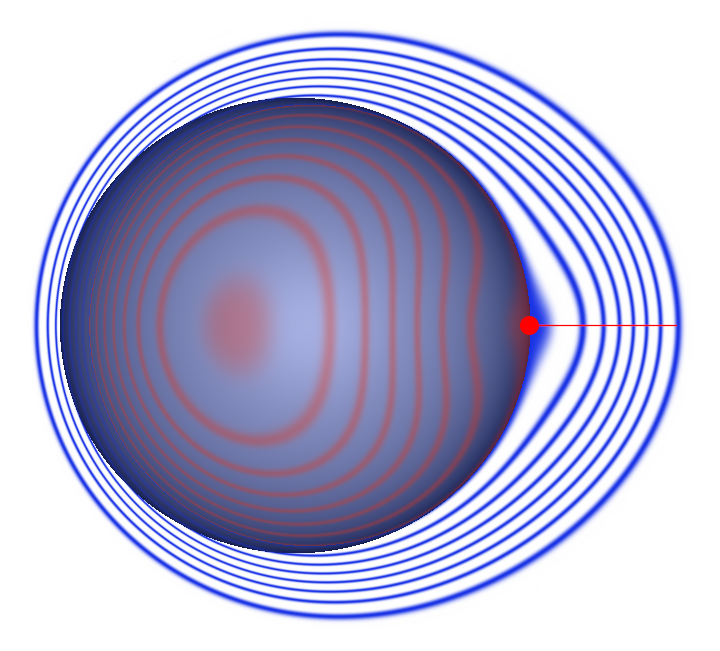 Other examples: look at the introductory figures, we see that when a point is too far away from the other points, a piece of surface gets separated from the main object producing a second piece of surface shaped like a bubble. I'll split this section into two parts. First part (Conventions) I'll describe the conventions and basic notions I'm using, it's the easy part. The second part (Building the scalar field \( f \)) is more difficult but not mandatory to use the C++ code available below, however it will be useful to anyone who want to re-implement the method. So, given a set of \( N \) points and normals \( (\mathbf p_i, \mathbf n_i) \) we seek a scalar field \(f: \mathbb R^3 \rightarrow \mathbb R\). By convention we want \( f \) to be equal to zero everywhere the surface lies. Since the surface must go through every points \( \mathbf p_i \) then \( f(\mathbf p_i) = 0\). Inside the shape \( f \) is negative and outside \( f \) is positive. The function \( f \) returns values ranging from \( [-\infty; +\infty ] \) and has increasing values from the inside to the outside. We say that \( f \) has a global support or is globally supported. It means the function varies everywhere in the ambient space \( \mathbf R^3 \). 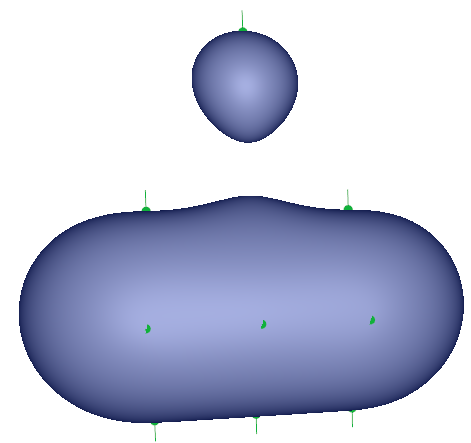 It's worth noticing Metaballs are not defined with globally supported functions but compactly supported functions. Indeed the scalar field of a metaball decreases from the center until it vanishes to zero at the metaball's radius. 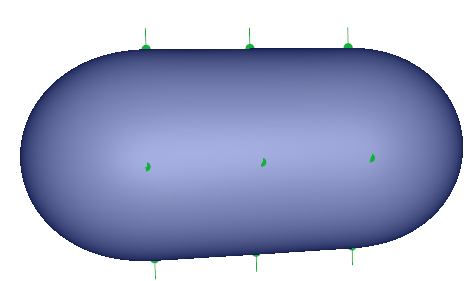 So the function of a metaball stops varying outside its radius which means we can bound the variation inside a bounding box hence the name compactly supported. If you want to blend objects by summing them as you usually do with metaballs they have to be compactly supported. 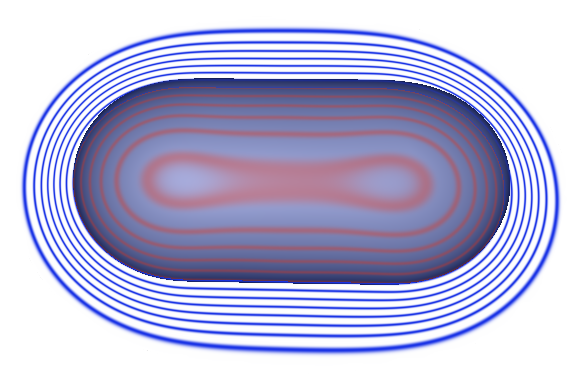 In this other entry I explain how to convert a globally supported scalar field to a compact support. The gradient vector gives at any point of \( f \) the direction of steepest ascent i.e. the direction towards which \(f\) increases most. If you look back to the iso-curves you'll understand that the gradient is always orthogonal to the curves and hence to the implicit surface. Indeed \( f \) doesn't vary if we follow a curve but increases the most when we go right through them. Note: reading this section is not mandatory to use the C++ code. As we said before points on the surface are associated to the value zero and normals and gradient must match. For this system I'm using a rather compact notation because there is actually \( 4N \) lines with \( 4N \) unknown. As it would take too much space I have put all the [ developments details in a pdf ]. If you're not interested in the developments I've made a [ summary with only the detailed matrix ] to solve the system. The point position in red is \( (0,0,0) \) and the normal direction is \( (1,0,0) \). So we can observe that each point correspond to a blob like function. 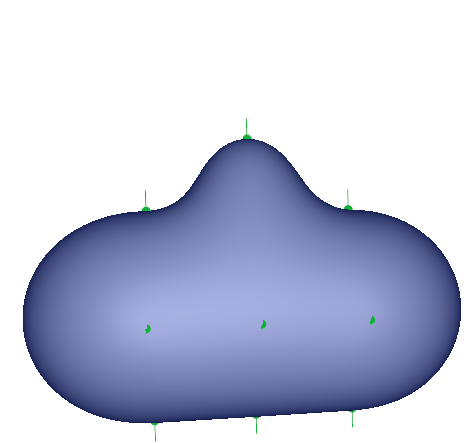 However the blob is not centered at the point position but its surface goes through the point. 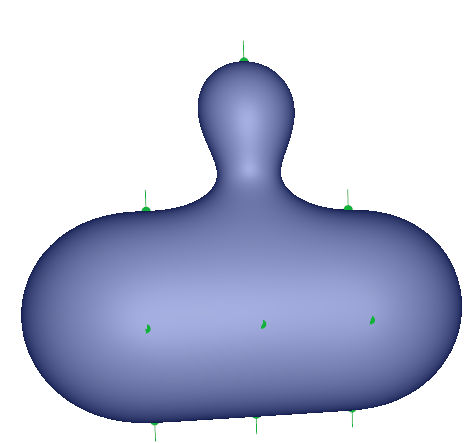 Moreover the normal controls the orientation of this blob. So the intuition is that by blending all the blobs with a sum we generate a final object whose shape goes through all the points. Be aware compiling in Debug mode is a lot slower than Release mode to solve linear systems. By any chance are you developing a Blender plug-in? Rodolphe: Nop sorry just the standalone app. Nice, thanks. Have you any more info, about selection of basis function as x^3 ? Rodolphe: not really it comes from my personal experience, I tried others (polynomials, thin plates etc.) but among the ones I tried x^3 performed the best.